This article is about real uses of directed energy weapons. For other uses, see Energy weapon. The Pentagon is researching technologies like directed-energy weapon and railguns to counter maturing threats posed by missile and hypersonic glide vehicles. These systems of missile defense are expected to come online in the mid to late-2020s. Light is only very slightly affected by gravity. An electrolaser lets ionization occur, and then sends a powerful electric current down the conducting ionized track of plasma so formed, somewhat like lightning. It functions as a giant high energy long-distance version of the Taser or stun gun. Weapons designed to cause permanent blindness are banned by the 1995 United Nations Protocol on Blinding Laser Weapons. The dazzler is a non-lethal weapon intended to cause temporary blindness or disorientation and therefore falls outside this protocol. The personnel halting and stimulation response rifle (PHASR) is a prototype non-lethal laser dazzler developed by the Air Force Research Laboratory's Directed Energy Directorate, U.S. Department of Defense. Its purpose is to temporarily disorient and blind a target. Blinding laser weapons have been tested in the past, but were banned under the 1995 UN Protocol on Blinding Laser Weapons, which the United States acceded to on 21 January 2009. The PHASR rifle, a low-intensity laser, is not prohibited under this regulation, as the blinding effect is intended to be temporary. It also uses a two-wavelength laser. The PHASR was tested at Kirtland Air Force Base, part of the Air Force Research Laboratory Directed Energy Directorate in New Mexico. On April 6, 2011, the U.S. Navy successfully tested a laser gun, manufactured by Northrop Grumman, that was mounted on the former USS Paul Foster, which is currently used as the navy's test ship. When engaged during the test that occurred off the coast of Central California in the Pacific Ocean test range, the laser gun was documented as having "a destructive effect on a high-speed cruising target," said Chief of Naval Research Admiral Nevin Carr. While classified, the proposed range of the laser gun is measured in miles, not yards. High Energy Laser-Mobile Demonstrator (HEL-MD) is a Boeing designed laser system mounted on a Heavy Expanded Mobility Tactical Truck. Its current power level is 10 kW, which will be boosted to 50 kW, and expected to eventually be upgraded to 100 kW. Targets that can be engaged are mortar rounds, artillery shells and rockets, unmanned aerial vehicles, and cruise missiles. Lockheed Martin is developing a 60 kW fiber laser to mount on the HEL-MD that maintains beam quality at high power outputs while using less electricity than solid-state lasers. Free-electron laser(FEL) technology is being evaluated by the US Navy as a candidate for an antiaircraft and anti-missile directed-energy weapon. The Thomas Jefferson National Accelerator Facility's FEL has demonstrated over 14 kW power output. Compact multi-megawatt class FEL weapons are undergoing research. On June 9, 2009 the Office of Naval Research announced it had awarded Raytheon a contract to develop a 100 kW experimental FEL. On March 18, 2010 Boeing Directed Energy Systems announced the completion of an initial design for U.S. Naval use. A prototype FEL system was demonstrated, with a full-power prototype scheduled by 2018. Using a phase-conjugate laser system. This method employs a "finder" or "guide" laser illuminating the target. Any mirror-like ("specular") points on the target reflect light that is sensed by the weapon's primary amplifier. The weapon then amplifies inverted waves in a positive feedback loop, destroying the target with shockwaves as the specular regions evaporate. This avoids blooming because the waves from the target pass through the blooming, and therefore show the most conductive optical path; this automatically corrects for the distortions caused by blooming. Experimental systems using this method usually use special chemicals to form a "phase-conjugate mirror". In most systems, the mirror overheats dramatically at weapon-useful power levels. The Chinese People's Liberation Army has invested in the development of coatings that can deflect beams fired by U.S. military lasers. Lasers are composed of light that can be deflected, reflected, or absorbed by manipulating physical and chemical properties of materials. Artificial coatings can counter certain specific types of lasers, but if a different type was used than the coating was designed to handle it would be able to burn through it. The coatings are made of several different substances including low-cost metals, rare earths, carbon fiber, silver, and diamonds that have been processed to fine sheens and tailored against specific laser weapon systems. China is developing anti-laser defenses because protection against them is considered far cheaper than creating competing laser weapons themselves. Particle-beam weapons can use charged or neutral particles, and can be either endoatmospheric or exoatmospheric. Particle beams as beam weapons are theoretically possible, but practical weapons have not been demonstrated. Certain types of particle beams have the advantage of being self-focusing in the atmosphere. A makeshift plasma railgun has been constructed using 3D printing. A multi-organization research program involved high intensity audible sound experiments on human subjects. Extra-aural (unrelated to hearing) bioeffects on various internal organs and the central nervous system included auditory shifts, vibrotactile sensitivity change, muscle contraction, cardiovascular function change, central nervous system effects, vestibular (inner ear) effects, and chest wall/lung tissue effects. Researchers found that low frequency sonar exposure could result in significant cavitations, hypothermia, and tissue shearing. Follow-on experiments were not recommended. The Long Range Acoustic Device (LRAD) is an acoustic hailing device developed by LRAD Corporation to send messages and warning tones over longer distances or at higher volume than normal loudspeakers. 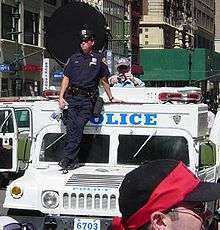 LRAD systems are used for long range communications in a variety of applications including as a means of non-lethal, non-kinetic crowd control. 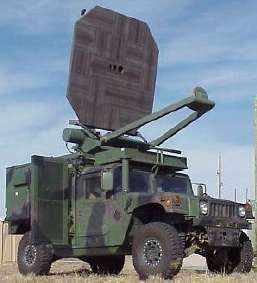 Though they have been called "sonic weapons", LRADs are not inherently for military use. According to the manufacturer's specifications, the systems weigh from 15 to 320 pounds (6.8 to 145.1 kg) and can emit sound in a 30°- 60° beam at 2.5 kHz. The manufacturer also produces systems for public address and mass notification use that broadcast 360°. 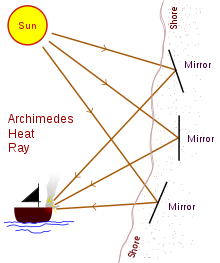 Engine-stopping rays are a variant that occurs in fiction and myth. Such stories were circulating in Britain around 1938. The tales varied but in general terms told of tourists whose car engine suddenly died and were then approached by a German soldier who told them that they had to wait. The soldier returned a short time later to say that the engine would now work and the tourists drove off. A possible origin of some of these stories arises from the testing of the television transmitter in Feldberg, Germany. Because electrical noise from car engines would interfere with field strength measurements, sentries would stop all traffic in the vicinity for the twenty minutes or so needed for a test. A distorted retelling of the events might give rise to the idea that a transmission killed the engine. Modern automobile engines are not mechanically but electronically controlled. Disabling the electronics can indeed stop the engine. This has been implemented in OnStar, which has a remote control feature, but this is not a weapon. It is an add-on to the electronics of the car. Because a car is operating on a closed system, it would be impossible to use an electronic means of disengaging an engine, short of electrocuting it via laser or pulse weaponry. See also electromagnetic pulse (EMP), which is known for its engine-stopping effect, but is an undirected-energy weapon. In 2015, Lockheed Martin reported a demonstration of the ATHENA Laser Weapons System that disabled the engine of a truck from a distance of one mile. Nikola Tesla (1856–1943), a noted inventor, scientist and electrical engineer, developed early high frequency technologies. Tesla worked on plans for a directed-energy weapon from the early 1900s until his death. In 1937, Tesla composed a treatise entitled The Art of Projecting Concentrated Non-dispersive Energy through the Natural Media concerning charged particle beams. During the early 1940s Axis engineers developed a sonic cannon that could cause fatal vibrations in its target body. A methane gas combustion chamber leading to two parabolic dishes pulse-detonated at roughly 44 Hz. This infrasound, magnified by the dish reflectors, caused vertigo and nausea at 200–400 metres (220–440 yd) by vibrating the middle ear bones and shaking the cochlear fluid within the inner ear. At distances of 50–200 metres (160–660 ft), the sound waves could act on organ tissues and fluids by repeatedly compressing and releasing compressive resistant organs such as the kidneys, spleen, and liver. (It had little detectable effect on malleable organs such as the heart, stomach and intestines.) Lung tissue was affected at only the closest ranges as atmospheric air is highly compressible and only the blood rich alveoli resist compression. In practice, the weapon system was highly vulnerable to enemy fire. Rifle, bazooka and mortar rounds easily deformed the parabolic reflectors, rendering the wave amplification ineffective. Microwave weapons were investigated together with the Japanese. It has been claimed that the USSR made use of the lasers at the Terra-3 site to target the Space Shuttle Challenger in 1984. At the time, the Soviet Union were concerned that the shuttle was being used as a reconnaissance platform. On 10 October 1984 (STS-41-G), the Terra-3 tracking laser was allegedly aimed at Challenger as it passed over the facility. Early reports claimed that this was responsible for causing "malfunctions on the space shuttle and distress to the crew", and that the United States filed a diplomatic protest about the incident. However, this story is comprehensively denied by the crew members of STS-41-G and knowledgeable members of the US intelligence community. Currently, the technology is being considered for non-military use to protect Earth from asteroids. ↑ "The Pentagon's Ray Gun". CBS News. 2008-06-01. Retrieved 2009-03-30. ↑ Archived August 25, 2010, at the Wayback Machine. 1 2 Fulghum, David A. (2005-12-17). "Israel tests improved Arrow interceptor". Aviation Week & Space Technology. Retrieved 2009-08-19. ↑ David A. Fulghum & Douglas Barrie (2005-09-06). "Radar Becomes A Weapon". Aviation Week & Space Technology. Retrieved 2014-05-16. ↑ Colonel of Aviation Grigoriy "Grisha" Medved (retd) (2008-04-13). "Grisha's Radar fry-off". Air Power Australia. Retrieved 2014-05-16. ↑ Mark Harris (27 May 2009). "US cops and military to get laser guns". Techradar.com. Retrieved 28 July 2010. ↑ Chris Matyszczyk (23 July 2010). "Police to experiment with blinding 'Dazer Laser'?". CNET.com. Retrieved 28 July 2010. ↑ "United Nations Office at Geneva". www.unog.ch. Retrieved 15 January 2009. ↑ Waldman, Harry (1988). The Dictionary of SDI. New York: Rowman & Littlefield. pp. 58, 157–158. ISBN 0842022953. ↑ F. J. Duarte, W. E. Davenport, J. J. Ehrlich, and T. S. Taylor, Ruggedized narrow-linewidth dispersive dye laser oscillator, Opt. Commun. 84, 310-316 (1991). 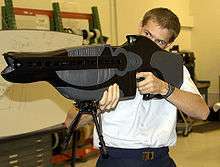 ↑ Pae, Peter, "Northrop Advance Brings Era Of The Laser Gun Closer", Los Angeles Times, March 19, 2009., p. B2. ↑ Northrop Grumman (2010-04-07). "Navy Shows Off Powerful New Laser Weapon". Foxnews.com. Retrieved 2011-09-25. ↑ Emery, Daniel (2010-07-19). "BBC News - Anti-aircraft laser unveiled at Farnborough Airshow". Bbc.co.uk. Retrieved 2011-09-25. ↑ Air Force Link News story on the PHaSR handheld rifle-style weapon. 2 November 2005. ↑ Wired News article "Weapons Freeze, Microwave Enemies" (and copied in at least 661 other web pages including this link) Archived June 14, 2006, at the Wayback Machine. ↑ "Jefferson Lab FEL". Retrieved 2009-06-08. ↑ "Airborne megawatt class free-electron laser for defense and security". Retrieved 2007-12-21. ↑ "Raytheon Awarded Contract for Office of Naval Research's Free Electron Laser Program". Retrieved 2009-06-12. ↑ "Boeing Completes Preliminary Design of Free Electron Laser Weapon System". Retrieved 2010-03-29. ↑ "Breakthrough Laser Could Revolutionize Navy's Weaponry". Fox News. 2011-01-20. Retrieved 2011-01-22. ↑ "The Leading Mil Net Site on the Net". milnet.com. Retrieved 2012-06-12. ↑ "Energy Citations Database (ECD) - - Document #7369133". Osti.gov. doi:10.1063/1.860681. Retrieved 2012-06-12. ↑ "Non-Lethal Swimmer Neutralization Study"; Applied Research Laboratories; The University of Texas at Austin; G2 Software Systems, Inc., San Diego; TECHNICAL DOCUMENT 3138; May 2002 Non-Lethal Swimmer Neutralization Study Archived February 10, 2012, at the Wayback Machine. ↑ Jones, R.V. (1978). Most Secret War: British Scientific Intelligence 1939–1945. Coronet. pp. 84,124. ISBN 0-340-24169-1. ↑ "Turning Up The Heat: Latest Evolution Of Lockheed Martin Laser Weapon System Stops Truck In Field Test" (Press release). Lockheed Martin. March 3, 2015. Retrieved April 8, 2015. ↑ Martin O'Collins, director (21 February 2006). "Weird Weapons: The Axis". Modern Marvels. Season 12. Episode 8. The History Channel. ↑ "Forschungsstätte für Hitlers "Todesstrahlen"". Main-netz.de. 2009-08-19. Retrieved 2012-06-12. ↑ Wang, C. P. (Ed. ), Proceedings of the International Conference on Lasers '85 (STS, McLean, Va, 1986). ↑ Duarte, F. J. (Ed. ), Proceedings of the International Conference on Lasers '87 (STS, McLean, Va, 1988). 1 2 Kononenko, Boris. "Silent Space Is Being Monitored". Retrieved 21 July 2011. 1 2 Zaloga, Steven. "RED STAR WARS". Retrieved 21 July 2011. ↑ "STS-41-G". Astronautix.com. Retrieved 2012-06-12. ↑ Smith, David (November 22, 2006). "Pirates shoot at Britons' cruise liner". The Guardian. London.